Bamboo and his friend Lotus were saved by a good samaritan after saw them narrowly missed bing hit by a car. 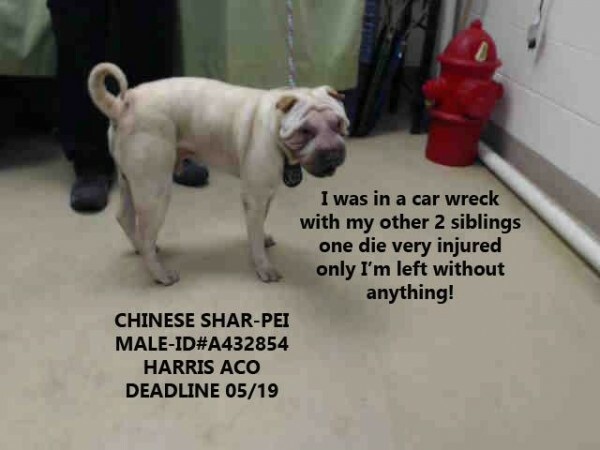 Unfortunately, the third Shar-pei who was with them was not as lucky and they witnessed her hit and killed. She got Lotus and Bamboo safely in her car (see photo) and police were called who took them to animal control. A plea for help was put out for them by the good samaritan and when their stray hold was up, we brought Lotus and Bamboo into NASPR's care. Get your application in on Lotus and Bamboo soon. They will complete your family!